The Historical Rise of Permissive Parenting Styles and the 3 Fear-Based Parent Strategies! • A good historical understanding of how permissive parenting (also know as the Freudian approach) saw the light of day as a stark contrast to the prevailing authoritarian parenting (known as the behaviorist approach)! 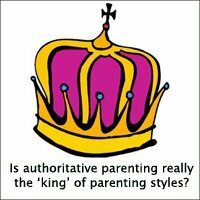 The Ongoing Battle of the Parenting Styles! If there's something people don't and probably never will agree it's parenting styles: What's good parenting and what's bad parenting? Child rearing and parenting are extremely sensitive subjects that make child experts engage in heated debates and leave parents confused with what parenting style to choose. 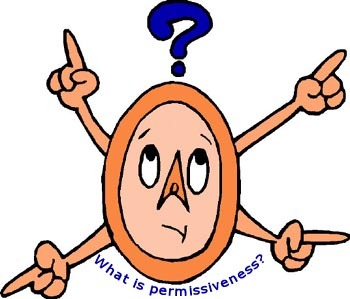 Particularly there seems to be a lot of confusion as to what is permissiveness and what characterizes the permissive parenting styles? 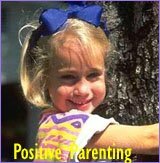 Some people seem to label positive parenting, attachment parenting and unconditional parenting permissive parenting. Other people, like myself, strongly disagree with this. Now, before discussing this any further, I think we need to take a look at how this permissive parenting styles polemic started! - Rebellious Freudianism Goes Against Mainstream Behaviorism! Behavioral (other names for the behavioral approach are authoritarian parenting or Victorian parenting). Freudian (also labelled as permissive parenting or the psychoanalytic approach). If we are to draw a rough line in the sand, we may say that the behavioral mindset reigned in the first half of last century up until the Second World War. After the Second World War the seeds of the at that time highly controversial Freudian approach were planted with American pediatrician Benjamin Spock at the steering wheel. I'll tell you more about Benjamin Spock and his revolutionary parenting theories in a bit. For now, let's first set the historical scene with a good understanding of the pre-war behavioral parenting style. - "The Child Must Be Strictly Controlled!" The representative face of pre-war behaviorism belonged to American behavioral psychologist John Broadus Watson. 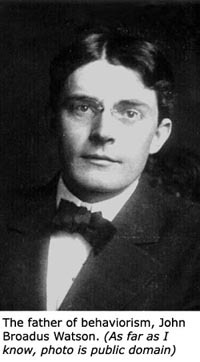 John B. Watson was famous for his 1928 parenting manual: "In Psychological care of Infant and Child". Before getting into his parenting ideas, it's necessary to take a look at Watson's worldview in order to better understand the background for his parenting advice. People were society's instruments and children were to be held under strict control so they could be shaped and prepared to fit nicely into the mechanical cogwheels of society. This meant bringing children's natural emotional impulses under strict control and installing strong discipline and sound work ethic. "Treat them as though they were young adults. Dress them, bathe them with care and circumspection. Let your behavior always be objective and kindly firm. Never hug and kiss them, never let them sit on your lap ... Shake hands with them in the morning." 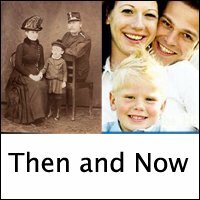 (Go to this article on the authoritarian parenting style if you want to learn more about the historical rise of the behavioral mindset). - "The Child Must Be Understood and It's Needs Met!" 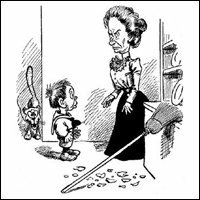 After the Second World War a rather radical paradigm change occurred and slowly entered mainstream parenting mentalities. 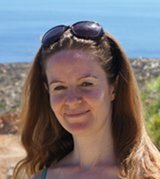 Whereas before children's basic impulses, emotions and desire were to be suppressed because they were seen as 'dangerous' to installing regularity, order and adult maturity - now pleasure, affection and impulses were seen and accepted as healthy personality aspects to cultivate in a child. 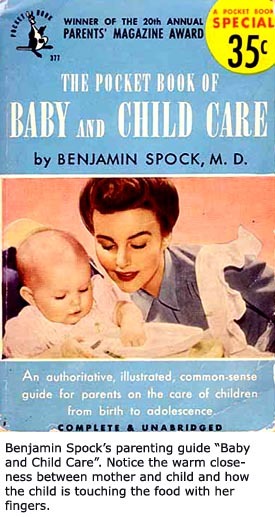 One book that is seen as the all time representative of this new child-centred mindset was Benjamin Spock's parenting manual: "Baby and Child Care". Basically Benjamin Spock transformed the non-punitive, individualistic child-centred Freudian viewpoints into everyday commonsensical language that every first time mom could understand and relate to. His primary advice to parents was that they should learn to trust their gut feeling. "Relax. You know more than you think you do." Not only were parents advised to follow their instincts, bond with their children, pick up their babies when they cried, be flexible and respect each child as an individual, they were also encouraged to have fun in the process. Imagine; having fun parenting! This was radical news! - Accused of Being an Advocate of Permissive Parenting Styles! Seen from the authoritarian behaviorist perspective it was only natural that Benjamin Spock's child-centred approach was labelled permissive. Really, seen through the lens of the past, what else could it be seen as? Whereas before the child was to blindly follow the adult, it now looked like the adult was to blindly follow the child! 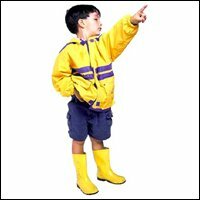 Benjamin Spock took point of departure 'inside' the child and tried convey to people how to understand, read and 'work with' the child's development stages (rather than trying to control them). Rather than discarding boundaries and limits as he has been widely accused he was in favor of what may be called age appropriate discipline. In his book he explains in layman psychological terms why children 'misbehave' at certain ages and give advice to parents on how they can set age appropriate boundaries. However, this child-centred perspective was easily misinterpreted as being indulgent and submissive to the child's every mood and desires. 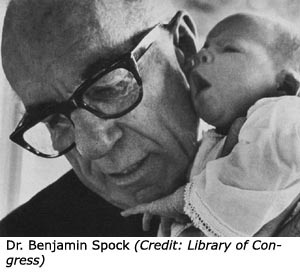 Therefore it's easy to understand that Benjamin Spock's heavy influence in the 1950s and 1960s was understood an expression of permissive parenting. Diana Baumrind Cemented Benjamin Spock's Approach as Permissive Parenting! In the 1960s developmental psychologist Diana Baumrind conducted her famous child rearing study. Her study ended with what became the all time famous theory on the 3 parenting styles: the authoritarian (the behaviorist approach), permissive (Freudian) and the authoritative. 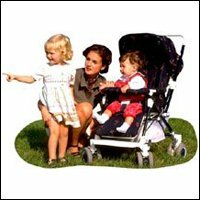 Here the permissive parenting style was further cemented as being a parenting style where there is little or no control or discipline, few rules and boundaries etc. Behavior-wise it was a stark contrast to the authoritarian parenting style. 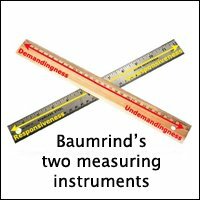 (Go to this article if you want more insight into how Diana Baumrind defined her version of the permissive parenting style. Today, I don't think the majority of people would consider Benjamin Spock's approach as an example of permissive parenting styles. Most people find his logic irrefutable and commonsense and his encouragement of trusting your parental intuition a good example of attachment parenting. 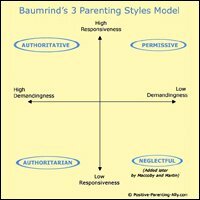 Many people look for Diana Baumrind's theories of parenting styles when trying to get a grasp of the concept of permissive parenting. 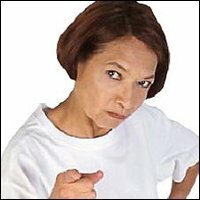 However, I do have a problem with her idea that if parents don't apply disciplinary efforts in case of conflicts, they are permissive. In my view permissive parenting styles are not about lack of control or discipline but about not intervening when the child needs the parent to intervene. And intervention can be everything from showing affection and acceptance to setting limits and creating routines. It's not just about control and reinforcing rules. The fear behind some parents' pleasing strategy is typically the parents' own fear of not being loved or not being needed! Deep down these parents are afraid that if they don't continually satisfy what they perceive are the children's needs, they will be 'superfluous' or 'un-needed'. This means adopting a pleasing strategy because of their own need to be needed. Deep down they are afraid that if they don't give and please all the time they will not be loved. - The Excess Freedom Strategy! The fear behind some parents' consistent no rules and no restrictions strategy is the parents' own personal fear of being restricted and deprived of freedom. These parents have a strong mental aversion towards all types of authority: like systems, leaders, rules and norms. 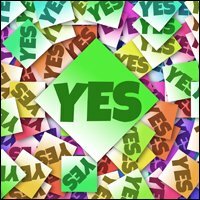 This dislike may be so strong that the parents' own issues with freedom become projected onto their child and come to wrongly represent the child's needs. Misinterpreting their own fears may consistently lead to avoiding routines and limits because of the fear of restricting the child and hindering healthy development and creativity. - The Upholding Peace Strategy! The fear behind some parents' consistent giving in or peace strategies may be the parents' personal fear of loosing their own peace of mind and inner stability. These parents strongly dislike conflicts and relationship tensions and will much prefer to give in or choose to not intervene rather than mess up family harmony. Keeping the calm and comfortable status quo is so important that they tend to let their children walk all over them which may result in a bossy attitude in the child. 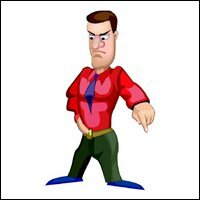 If you recognize yourself in some these permissive parenting styles or are just curios to know more about them, you might like to read this article on permissive parents. 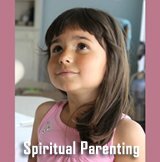 If you want to know more about parenting personalities in general, you might like to try my parenting quiz which is inspired by the personal development tool, the Enneagram. 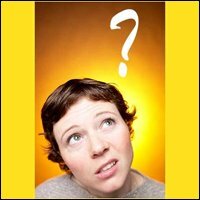 To see a list of topic relevant articles to this parenting article, please, follow the links below! Back to the top of this page about The Historical Rise of Permissive Parenting Styles and the 3 Fear-Based Parent Strategies!